Dogs enrich our lives in countless ways. They buoy us up through their boundless loyalty. Remind us not to take ourselves too seriously. Keep us moving and laughing. But sometimes dog behavior brings frustration, worry, disappointment, and stress, too. If the joy of your canine companionship is eclipsed by troubling behavior issues, I’d like to help. As a highly-trained dog trainer and canine behavior consultant, I use the science of applied behavior analysis combined with the latest in reward-based dog training techniques. My goal for you? A clear path to better behavior and joyful companionship. A Your puppy is biting and chewing all the wrong things and pottying in all the wrong places. You’re losing sleep and hair. B Enjoy a calmer puppy who’s learned the rules of polite society. A Your dog drags you down the street, forgets his name when you call, and generally has you throwing your hands in the air. B Enjoy a focused dog who looks to you for direction in all situations. A Baby’s on the way or toddler or young children are already here and you have some concerns. B Enjoy a safe household full of pattering feet and paws. A Walks have become a nightmare, with your dog lunging, barking, and growling at fellow canines. B Enjoy walking your best friend again, drama-free. A You’re embarrassed or frightened by your dog’s reactions to household members or strangers. B Enjoy a relaxed dog and peace of mind. A You regularly come home to disastrous messes, a stressed dog, and angry neighbors. B Enjoy leaving the house, guilt- and worry-free. Ready to connect the dots from Point A to Point B? I look forward to forging a clear path forward for you and your dog. Melanie is dedicated to helping clients live more joyfully with their dogs through the power of science. That’s why she continually pursues the very best in dog training and behavior education despite her extensive background in applied behavior analysis. It’s also why she uses only positive-based training techniques. Learn more about Melanie’s credentials and approach to training. Dog Training & Behavior Consulting for the Main Line and Chester, Delaware, and Montgomery Counties. 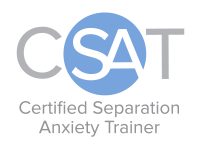 Online consults for Separation Anxiety clients anywhere in the world.